When it comes to technology, there are so many ways to do the things your business requires and no shortage of the types of software and apps to do them with. As teams become leaner and budgets get slashed, it’s no wonder we all feel so time-poor these days. It feels hard to keep up. This list is by no means exhaustive, but it’s a sampling of some of my favorite free or freemium tools that I have used in my time as a digital growth strategist. This list can feel overwhelming, so use the table of contents to jump to the section you’re interested in now, bookmark the page, and come back when you’re looking for something else. Oh, don’t forget to share the love if you think some folks in your networks might benefit from this list. 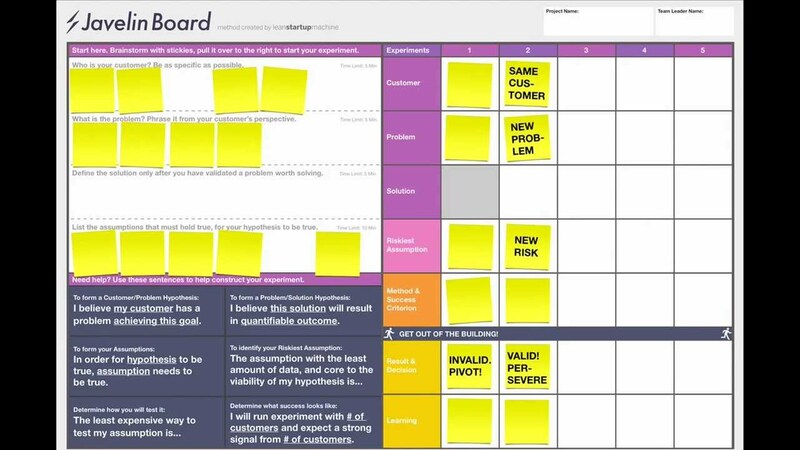 An all-in-one software to help startups and businesses identify, get feedback from and connect with potential customers, Javelin experiment board can help. Request a recording of real users navigating your website. Tap into user testing using real people to proactively identify and even eradicate poor user experiences that can negatively impact sales. Few things in life are more frustrating than choosing a great website name just to find out the domain is unavailable or already claimed on the social media apps you need to use. The apps below can help you come up with a name that is available without all the guesswork. Enter a word, and Naminum uses prefixes, suffixes and replaces letters within your keyword to generate a (huge) list of name suggestions. If the domain name you wanted is taken, enter your main keyword in this handy app and it will generate domain name suggestions that are available. This app generates suggested domain names along with a trendy, hip design suggestion. Click on different elements in the logo design to see different styles. Find the combination you like and then buy that domain. Enter your main word and tell the app what to add before or after to generate thirty different combinations of available domain names. Select the combination you want and register it. Checks your desired business name for availability on Twitter, Instagram, Facebook, and Tumbler. If it’s available, you get a green dot. Red if it’s not. This handy app takes a word you choose and adds letters before or after to generate made-up words to use as company, domain, or product names. Choose your must have word and this app generates thousands of business name ideas by adding entire words before or after. Not a brand namer, but a fake person namer great for mockups or wireframes. Produce a single real-sounding but fake profile for a single user or a bulk number of users if needed for your mockup or other projects. Choose your user profiles randomly or specify gender and other demographics including country of origin. When it comes to choosing the perfect business name complete with professionally designed logo, Brandroot has done most of the work for you. Save time and frustration and find your perfect brand identity. The service is free to search (and great for brainstorming), but if you love one and want to use it, you gotta buy it. Free legal docs for startup founders and investors. KISS (Keep It Simple Security) documents are “open source” and purposefully created to be balanced, flexible, and simple. Choose from debt or equity versions. Scroll midway on the page to get the goods (see below). An open collection of free legal documents. Docracy provides customizable templates, timestamped secure document signing for both parties, and secure document storage. Like DocuSign, but free. Create, sign, and send legally binding agreements in seconds. Free for personal use. Just state your company name and its slogan (optionally) and Logaster will automatically generate multiple variations of logos for you. They’re not all winners — in fact, a lot of them are pretty bad. Hey, you get what you pay for here. But they can be a great inspiration to snag and give to a designer on 99Designs or Fivrr. Use this hip tool to generate a personalized logo design for your business complete with a downloadable PNG file for use elsewhere. Use this handy tool to produce a simple but professional logo to represent your business website. Squarespace account holders use for free. What happens next? MILLIONS of search results with each one typically having a roundup of 10-100 themes. I did a quick search for “best free WordPress themes 2017” and had over 7 million returns. Considering most of those results had over 40 listed, I’m looking at easily 21 million themes to sift through. There will be duplicates — but I’m NOT scrolling through that many results. My time is valuable. So is yours. Enter TemplateStash. They curate the best templates into a pleasant stream for easy browsing based on precise criteria. What’s left is an easy-to-digest resource of high-quality, responsive templates and themes broken out into categories by platform. Find the perfect website template for your new business or startup. Add your own customized touches and images to pull in potential customers by telling the story of your brand. Get a beautiful, responsive, website or landing page design for your business. Simple yet functional, no design or coding experience required. Strikingly leaves you more time to focus on your business. Take the worry out of your startup launch process with The Startup Checklist by Atomic Squirrel. Use your checklist in combination with the recommended resources and additional reading to help your business launch go smoothly. Secure your website, development installations, or local servers using this free PKI. Use the TinyCert friendly user interface to help you manage the certificate details easily. Let’s Encrypt is a free, automated, and open certificate authority provided by the Internet Security Research Group (ISRG). Pretty sweet considering Google prioritizes sites in search engine results with SSL Certificates (https) implemented on their sites. Use Zapier to connect various web apps and pass info and data between them via workflows or Zaps. Triggered by something such as the arrival of an email or any action you choose, Zaps automatically perform follow up tasks. When all tasks are complete, Zaps can even alert you with a text message or email. Download IFTTT to your mobile devices and set up automatic alerts and other actions to occur automatically in succession. Use an applet to automatically save any new email attachments to your Google Drive, automatically log outgoing phone calls, or any of hundreds of other tasks. Check out my list of 6 Ways to Automate Your Marketing Like a Boss with These IFTTT Applets to help you get started. Use the powerful tools provided by the apps below to monitor and track user behavior and collect feedback. Get to know your target audience through heatmaps and recordings. Find out what works and doesn’t about your website, why visitors leave, what confuses them, causes hesitation, and stops them from converting. Make informed improvements that matter to your bottom line. One of my favorite analytics dashboards that pulls in from multiple sources to view all in one handy location. Cyfe is an all-in-one dashboard that helps you monitor data across multiple sites and applications, such as Google AdWords, Salesforce, PayPal, MailChimp, and WordPress. You can even upload your own data files to Cyfe to create a custom widget report in case there’s a data point that doesn’t have an existing integration. The platform itself is for enterprise clients (and they have a price tag to match), but their free reporting offerings are pretty solid to get a lay of the land. They’ve got all six major social networks covered: Facebook, Twitter, LinkedIn, Google+, Instagram, and Pinterest. You can’t specify date ranges and some only cover a few weeks at a time, so if you become dependent on these impressive (and visually stunning) reports, then I suggest you create an auto-reminder on your calendar to pull them since the freebies do not have an automated option. I’ve listed the report types below. It’s definitely worth your time. Nice, free social media monitoring tool that can alert you via Slack or Hipchat whenever your brand or any other topic you are interested in gets mentioned. Free Forever plan for up to 2,000-page views daily includes 3-month data storage. Small businesses and startups with 10,000 pageviews/day can get Hotjar with 6 months data storage starting at $29 monthly. Start with a 15-day trial. Upgrade as needed. QuickSprout was created by Neil Patel (Founder of KISS Metrics and CrazyEgg) and focuses on optimizing your website content to get you in front of your target audience. It’s like having an SEO specialist in your pocket to point out changes and guide you to better optimization. 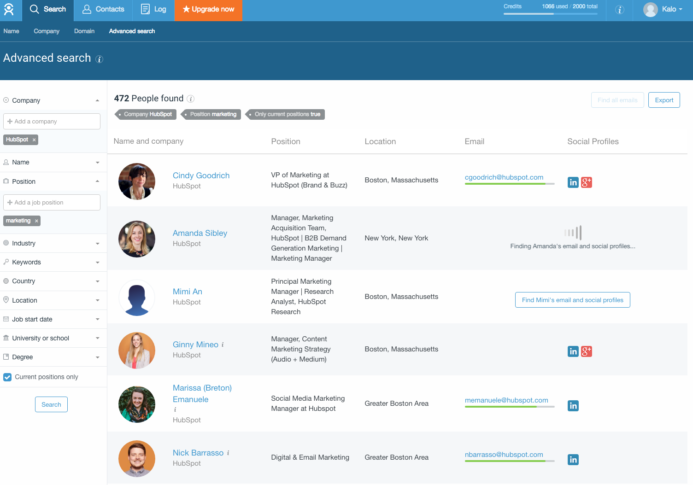 Headreach finds targeted leads along with their email address and social profiles. THier app lets you target leads using 12 filters. Get 10 free leads when you sign up. People on the free plan get 10 searches per month to pull personality profiles, relationship reports, and email coaching on the CrystalKnows.com website and when browsing LinkedIn. This handy tool helps you find those corporate emails you need to more fully develop your prospects and leads. Sign up free (no credit card required!) and get 50 free leads. After that, pay as you go and tiered pricing is great for solopreneurs and small businesses. Drift’s artificial intelligence chatbot service is elegant in its simplicity. Instantly engage users who are looking at your website with Drift’s live chat. Chat with prospects, schedule meetings, and send sales email sequences. The free forever plan includes up to 100 contacts per month. Hunter integrates smoothly with your browser to find email addresses of a specific domain and works like a charm for LinkedIn profiles. You get 100 free searches a month. Start tracking those leads from your website or landing page. Track contacts with prospects and get company insights. From the trusted HubSpot name, comes CRM for small businesses, and it’s free. Upgrade as your business grows. Communicate with prospects in their comfort zone whether it be in person, by phone, through social media, or chat. Track visitors and analyze email to discover ways to engage with your clients on their turf. Free for 10 users and 25,000 contacts. A fan favorite among freelancers and new startups, you can use the free forever plan with one login and three connected accounts. Schedule posts, monitor and engage with your community, run sweepstakes, get real-time analytics, and connect tons of other apps or RSS feeds. I am a massive fan of Buffer. Set up a schedule and any message you queue up will automatically publish during one of your predefined post times. Free starter plan with up to 3 social media accounts plus three business plans to choose from so you can upgrade your business grows. People do business with brands they know, like, and trust which is why you need to keep your finger on the pulse of what’s being said about your brand. Monitor your brand and reputation by eavesdropping on what your customers are saying or tweeting with these key analytic tools for freelancers, startups, and businesses. Use GoogleAlerts to monitor conversations and mentions of your business name or brand. Use what you find to address customer concerns, make improvements to products, or otherwise address customer pain points. Similar to GoogleAlerts, Talkwalker can be used to alert you whenever your business name, brand, or other specific phrases of interest come up around the Internet and on Twitter. This app pulls user-generated data from all over the web, including news, blogs, videos, comments, and more. Search for specific words, phrases, or your business name. Find out who is talking about your brand or business name with Mention. Set your alert using specified key phrases and let Mention scour the Internet for any chatter and return the results to you. If you’ve ever wondered what your competition has that you don’t, these nifty tools can help you discover the differences between your sites and that of your competitors. Use the insights you gain from these tools to improve your pages and attract more customers. Plug in any website or mobile app, receive insights about traffic and rankings, and compare the data against competing sites. After entering a URL, you can see the website’s global rank, country rank, category rank (such as Books and Literature, Shopping, and Marketing and Advertising), and traffic by country. You’re also treated to an overview of total desktop and mobile visits from the past six months, which are broken down by time on site, pages per visit, and bounce rate. You can also glean top referral sites, organic search traffic vs. paid search traffic, a breakdown of traffic from social platforms, the most popular subdomains, a ranking of similar sites, and categories that interest your audience. Researching keywords in display ads, organic and paid search, and link building. Just enter a domain, keyword, or URL in the search bar, and you’ll gain access to a wealth of insights. Get insights into how to improve your own FB page and check out competitor Facebook pages. Get analytics for your social media pages and find out how your competitors stack up. Plan, write, schedule, and then publish your posts to all your networks from one central place. Free Forever plan with limited features. If you can drag and drop, you can design with Canva. Create quote graphics, social media graphics, ads, and loads more. Use Pablo’s library of images to create eye-catching images for your social media posts, website, or other digital projects. You can also upload your own images to manipulate or modify. No registration, login, or credit card required. Buffer created Pablo, so you know it’s quality! Includes multiple photo editing tools as well as design tools that let you re-edit any image. This isn’t really a tool as much as it is a directory. PressPass is an interactive directory of journalists organized by media outlets, beats, & regions aimed at making it easier for small businesses, non-profits, start-ups and citizen reporters to get their news-worthy stories out to the right reporters. Another directory that breaks down the company, their category listings, where to submit pitches, relevant twitter handles, Alexa rankings, and regional appeal. The key to engagement is telling your brand story effectively. HARO saves you time by connecting you to more than 55,000 writers and 800,000 sources so you can tell your brand story in the best way possible. Learn how to pitch and how and where to get media coverage using the PRstack guides and tons of resources found here. This handy tool lets you create a cohesive press kit for your iOS app that includes screenshots, app icons, and other information needed to present it or let others write about it easily. Manage all your email communication, landing pages, and opt-ins via MailChimp. Design branded forms and pop-ups to capture user information and build your email list. Start with the Forever free plan and upgrade as your email list grows. Designed specifically as a plugin for WordPress, ContactForm7 lets you customize a form to display on your website. Create autoresponders to new subscribers and internal notifications to email you when you have a new form submission. Pair ContactForm7 with Flamingo (also free) to act as your database to store all the data from form submissions. If you want to use MailChimp to send, you can use this free plugin to automate the integration to the appropriate list. MailPoet is also integrated with WordPress to help you capture important customer data about how your emails are being received. Use MailPoet in combination with ContactForm7 to send drip campaigns to segmented lists all within WordPress. Start with their free plan that provides overall open rates, upgrade to premium with sending for $10/month and more detailed stats, or upgrade to premium only for $99 annually. The generous Essentials plan enables businesses to send up to 40,000 emails monthly included in the plan for under $10 monthly. Perfect for solopreneurs who want to send email but don’t need all the extra marketing campaign tools. The free plan with SendInBlue is great for small businesses who are sending up to 9,000 emails monthly. For those who want to try their hand at marketing or who are experienced marketers, there are four additional pricing tiers based on list size available. Bite-sized hack tips modeled after the same elements successful startups and established companies use to drive traffic and increase conversions. Check out their tutorials to learn how to bone up on growth tactics. For those familiar with Bitly link, optimize.ly is their component for branded short domains. Case studies demonstrate up to 34% CTR increase over plain unbranded links. Improve clarity and readability of your content with the Hemingway App. Write your content directly in the app or paste in your content and let Hemingway highlight issues to be addressed. Put your best business foot forward with your written communication no matter what social media platform you use. Grammarly alerts you to any grammatical or spelling mistakes in your writing so you can correct them before you hit send. Personally, I have been using Grammarly Premium for three years and I absolutely love it. Your headline is your first impression on potential customers. Use this free tool to write headlines that grab attention and compel readers to click through and visit your site or read your content. Paste in long content from articles or other documents to get a shorter summarized text. Any favorites forgot to mention? Tweet me @selinamb or post a comment below. With the right combination of these free tools for startups, small businesses, and freelancers, you can throw your hat in the ring and go toe to toe with your competitors. Get organized, get automated, and get your business noticed.